God does not want you to vote for sick perverted pukes like Ronan Oger. This cockroach calls himself Morgane and is being called to account for what he is by Bill Whatcott. Times for some sanity Canada. Time to support Bill Whatcott and put and end to all public exposure of such ‘cheeky bastards’ as you see here. Ronan Oger (wearing pink cowboy hat on the left) smiling at a bare bummed homosexual at the Vancouver homosexual shame parade is not a suitable candidate to look after your children’s education. Ronan Oger is deluded (he is a biological male who claims to be a woman) and he is tyrannical. 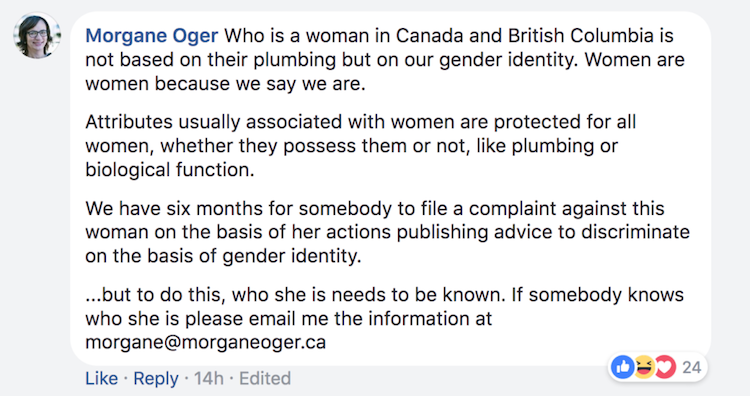 Mr. Oger quickly resorts to state coercion to silence those who disagree with his so-called gender identity, as shown by this one of his many delusional and tyrannical Facebook posts. This entry was posted in Critters of Contempt and tagged Bill Whatcott, Ronan Oger the cochroach, Trudeau type of subhuman by thinwahtruth. Bookmark the permalink.